Cook lasagna noodles as directed on package. Drain; place in cold water to cool. Meanwhile, heat oven to 350°F. Heat oil in large skillet over medium-high heat until hot. Add garlic, broccoli, mushrooms and bell pepper; cook 3 to 4 minutes or until vegetables are crisp-tender, stirring frequently. Remove from heat. If necessary, cut broccoli into smaller pieces. Beat egg in small bowl with wire whisk. Add ricotta cheese and Italian seasoning; mix well. Drain cooled lasagna noodles. Spread 1/2 cup of the pasta sauce in ungreased 13x9-inch (3-quart) glass baking dish. Top with 4 noodles, overlapping as necessary, half of ricotta mixture, half of cooked vegetables, half of remaining pasta sauce (about 2 1/4 cups) and 1 cup of the shredded cheese. Repeat layers, starting with noodles. Bake at 350°F. for 45 to 50 minutes or until hot and bubbly. If cheese is getting too brown, cover baking dish loosely with foil. Let stand 15 minutes before serving. Ricotta is fresh cheese with small soft curds. Its name is Italian for "recooked"; ricotta is made by reheating the whey drained from mozzarella or provolone cheese. Ricotta's mild flavor and loose texture combine well with both sweet and savory ingredients. The 6-chese Italian blend contains mozzarella, smoked provolone, Parmesan, Romano, Fontina and Asiago. 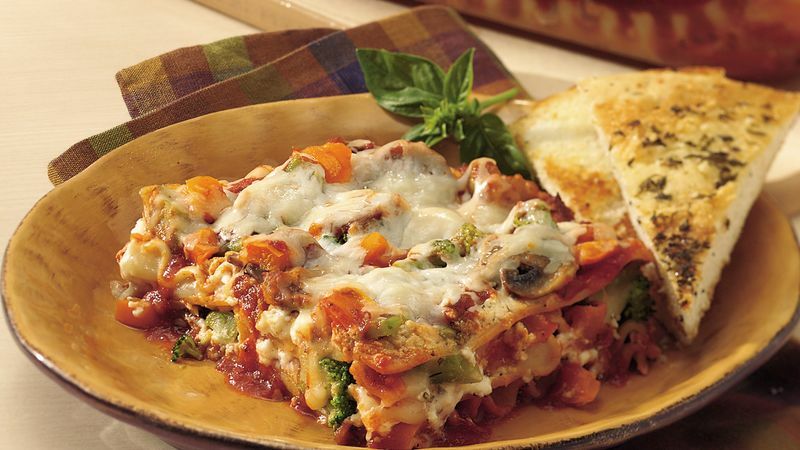 Use another combination of Italian cheeses from your refrigerator in place of the 6-cheese Italian blend. Try Asiago, mozzarella, Parmesan and provolone; shred the cheeses and measure 2 cups.